Quinoa is a great breakfast choice for vegetarians, vegans, or anyone who just wants to eat a healthy and cholesterol-free whole foods breakfast. You can use leftover cooked quinoa in just about any of these recipes, or, try using quinoa flakes, which are a quick-cooking breakfast alternative. All of these breakfast quinoa recipes are vegetarian, most are vegan or nearly vegan and most are gluten-free as well, since quinoa is a gluten-free food. If you like having quinoa for breakfast, you mght also want to try teff. Not sure how you'll feel about quinoa for breakfast? Try using a combo of half oatmeal (or your usual hot breakfast grain or grain blend) and half quinoa to start, or, try a combo of half oatmeal and quinoa flakes to ease yourself into it. 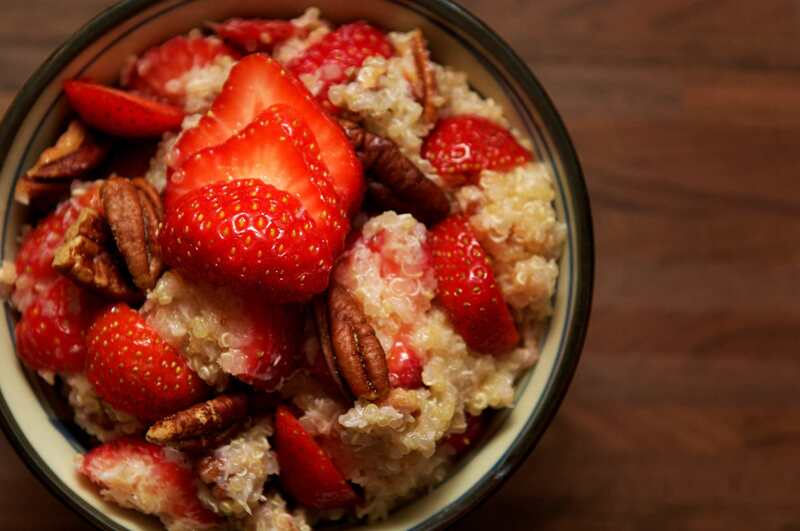 Quinoa breakfast porridge with strawberries. Your basic quinoa breakfast bowl is made with whole grain quinoa cooked in water or soymilk, drizzled with a bit of natural sweetener or a few extra flavors, and topped with fruits, nuts or other healthy superfood boosts. This quinoa breakfast porridge recipe is no exception. Try topping it off with hemp protein powder, flax meal, chia seeds, or a drizzle of flax or coconut oil. I love having chocolate for breakfast, and, I love having quinoa for breakfast, so this chocolate banana quinoa recipe is pretty much ideal for me. Like most morning quinoa bowls, it's vegetarian, vegan, high in protein, refined sugar-free and gluten-free, which makes it pretty much the perfect breakfast, no matter your taste or dietary needs. I really wanted to gobble these baked quinoa egg muffins all up, but I managed to save a few to share. They made a great breakfast on the go for a couple of my friends who left early in the morning on a long road trip with their kids. Think of them as little mini frittatas with quinoa, as they are more liked a baked egg casserole than a bread-like muffin, really. Maple cinnamon quinoa breakfast bowl. If you normally like your oatmeal with raisins and cinnamon in the morning, then this classic cinnamon raisin quinoa breakfast bowl is the perfect breakfast quinoa for you. It's made with quinoa, sweetened with maple syrup and topped with cinnamon and raisins, so the flavors are simple and familiar. If you've never had quinoa for breakfast before, you're missing out, and this recipe is a great place to start with. Try this easy recipe - it's vegetarian, vegan, and gluten-free. Not sure how you'll feel about quinoa for breakfast? Try using a combo of half oatmeal and half quinoa, or, try a combo of half oatmeal and quinoa flakes to ease yourself into it. Even with a bit of cocoa and sweetener, this chocolate peanut butter breakfast cereal quinoa is still much more nutritious than the sugar-packed, processed, and refined cardboard-box brands in the supermarket. See if your kids won't just trade in their "chocolate-frosted sugar bombs" or whatever the kids are eating these days, for this refined sugar-free and much healthier high-protein breakfast bowl. Perfect for vegan kids and picky eaters who need to get some nutrition. Lately, I've been sprinkling a little hemp protein powder in my morning quinoa bowl, and with all the peanut butter in recipes like this one, you can't even taste it at all. These little quinoa cookies are vegetarian, vegan, high in protein, refined-sugar free, and, if you use a gluten-free oatmeal, they're gluten-free as well. And with just six easy ingredients, they are super-quick to whip up. In other words, these breakfast cookies are pretty much the best thing ever. What's not to love? Tempeh hash - a great high-protein breakfast idea!. Need more protein-boosting breakfast ideas on a meat-free diet? If you like to get your protein first thing in the morning, there are many other high-protein breakfast ideas for vegetarians and vegans. Besides quinoa and quinoa flakes, there's some great ideas for tofu scramble, tempeh hash (pictured), plenty of vegetarian and even egg-free vegan quiche and frittata ideas, some high-protein smoothie ideas and more.